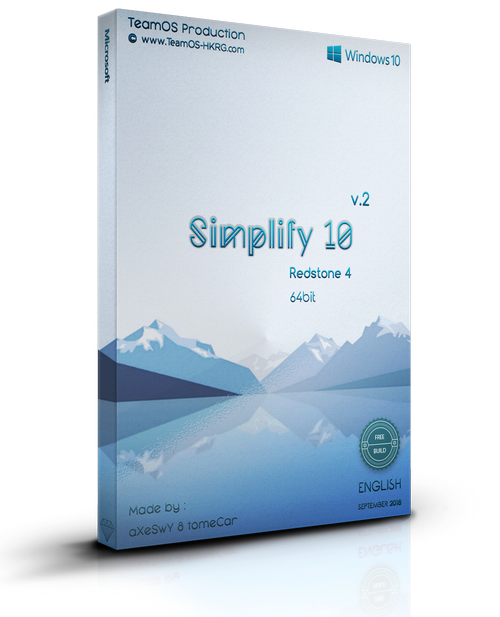 Torrent + Direct - Simplify 10 V.2 ( Free Build ) [ Win10 Rs4 Pro X64 ] :axeswy & Tomecar: | Team OS : Your Only Destination To Custom OS !! This System is mainly built for Old PC usage.. you can use it for web surfing ..movies watching and listen a music.. i don't advise it for commercial work like Photoshop or video editing.. coz some service is put to manual or disabled for better performance.. but main once are just fine.. have test this build for 15days... and works just fine.. Enjoy!! Special Thanks to: @dpcdpc11 Theme Maker. There has been a lot of interest in builds for the older, low horse power machines. This will take care of that. You are taking care of all of our needs here at TeamOS. This look nice, I have old 2007 laptop that even run Win10, I will like to try this os in it Thank you! This should keep a lot of member happy! Nice clean lines -- lots of junk removed! Very cool! Question Tom work's with solidworks , autocad and other ? In my testing..with photoshop all was ok..but there was some bugs..im not 100% sure is it PS or build problem...but with video editing i did have driver problem..and did have to reinstall same driver to make it work.. in finish i belive all will work..but u can test it and report back..
Main problem i did have with StartIsBack.. new version didnt work at all for me.. so i did add old and new for u to use.. ooooooooh!! Just realised I still have usercloud premuim.....downloading now!! Could I share another link with others? i love this build simple & only 2.2Gb cool. My grandma is happy! She said to me it is simply perfect ten OS and I must have it! Yes, she is downloading, and I will explain to her that she must be seeding... or will be kicked out Nice job again. Bravo TeamOS!